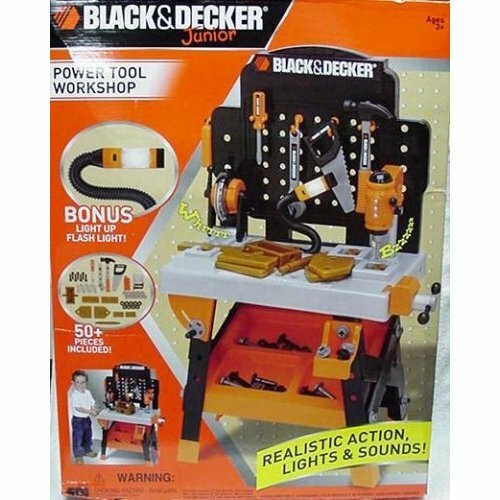 My Family Fun - Black and Decker Jr Power Workshop Workbench Includes Electric Workbench and Electronic Tools! 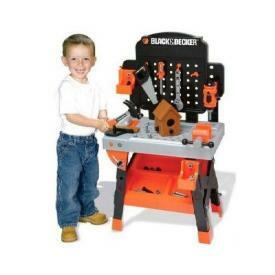 Includes Electric Workbench and Electronic Tools! For your young boy! It comes with a circular saw with sparkling effects, real working drill press, play cell phone, hammer, screwdriver,saw, wrench, nuts, bolts and screws. The set also comes with a pretend birdhouse that kids can build with the tools included. Black & Decker Jr Kids Power Workshop Workbench + Tools, 50+ accessories and BirdhouseBlack & Decker Junior - "Power Tool Workshop"Includes Electric Workbench and Electronic Tools! 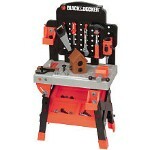 Receive Both the Work Bench and the Tools The Black & Decker Junior Electric Workbench provides little workers with hours of "constructive" entertainment. It comes with a circular saw with sparkling effects, real working drill press, play cell phone, screwdriver, saw, wrench, nuts, bolts and screws. The set also comes with a pretend birdhouse that kids can build with the tools included.